Wow, you have done a lot of hunting !!!!! The author I was trying to remember was Paul Matthews. He writes mostly about the 45/70 and maybe his techniques work well for that cartridge but they didn't prove out in my limited experiences. I wasn't using the rag paper and that may have been part of my problem. Thanks for the link. I have had some interesting PPB experiences over the weekend and a graph I have kind of sums up the ballistic part of it. mtngun, How can I insert a picture or a cut and paste from excel or word into a page here? I am sure it is obvious but I am kind of dense...maybe its the lead. I think maybe I am trying to push these ppb too fast, either that or I need to start hunting the elusive "broad side of barns". My target back board is 24" x 30" and only 14 out of 25 rounds hit it at 80 yards. Now maybe my scope was knocked off alignment because I had it in the back seat of the car, with no case, on a recent trip to a friend's house. This weekend my time was rather limited. I didn't have any proven rounds available and just tried to sight-in with the PPB. There is a small canyon between my shooting bench and my target so I can't really move it in to get closer. Between 15 and 75 yards its very verticle. I'll try again with slower loads this coming weekend and have some of my standard 250g round nose loads available for comparison. With this rifle (35 Whelen) I have been getting 1.4" groups of 5 shots including the persistent flyer. 4 of the 5 shots have typically been around 0.8" for my better loads and some better. This is at 80 yards so the 100 yard comparison would be somewhat larger groups. Regardless, I know this rifle shooting in this bullet weight will produce reasonable groups. The rifle is a well done Mauser 98 conversion with a Douglas Barrel. I am using a Busnel 6x-24x, 40mm, 1 inch scope. There is some parallax, which is fairly manageable, with this scope even at these short ranges and that is probably 1/2 of my typical error. I need to upgrade to a better scope but there always seems to be something else to buy first. I do this sort of shooting with a lead-sled with about 25lb of lead on it. I use the sled for two reasons. First I am really trying to differentiate the characteristics of the loads as opposed to my shooting ability and second, I typically shoot between 100 and 200 rounds on a good day and the Whelen with 250 G bullets flying out at 2500 FPS provides a pretty good workout for an old fart like me. Spreadsheet graph ? Unless the spreadsheet has a built in function to "save as" a jpg or similar image file, I'd suggest taking a screenshot of the graph, load it into your favorite graphics program, crop the graph from the screenshot, resize to 800 pixel wide, and save as a jpg. Sounds complicated, but it takes longer to describe than to do. Once you have a jpg, there are two ways to post it on the forum. One way is to use the "upload attachment" feature that you see near the bottom of the page when you are posting here. There is a limit to the file size, I think it is 100K. You should be able to meet the size limit as long as you save your jpg 800 pixel wide and "optimize" it when saving. 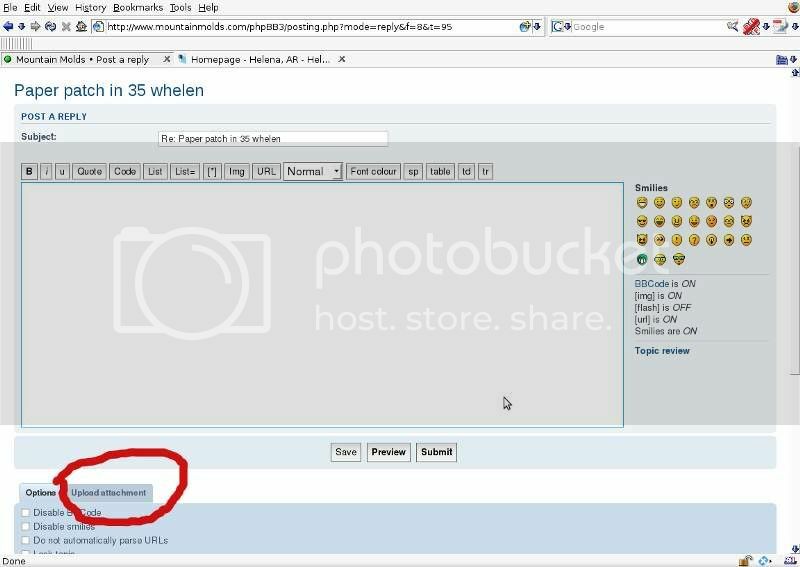 The alternative way is to upload your jpg to a photo site like photobucket, then paste the tag into your post. Photobucket has the forum tags already made up for each of your pictures, you just copy it and then paste it here. Photobucket is free, too. -- "print screen" button on keyboard. This copies your entire screen onto your clipboard. You can then paste the clipboard into your favorite graphics program. -- most graphics programs have a built in "screen capture" or similar function. Likewise with the graphics program, if you don't already have one, there are several free ones out there. Necessary for cropping and optimizing graphics that you share on the web. I use Gimp, not the greatest or the easiest, but it's OK. I'm sorry, I dont see an "upload attachment" anywhere on my screen. I have it in a jpg file. I cant access the photobucket type sites from where I am. Its not that important, but thanks for your great site. I just looked again. My screen does not have the "Upload attachments" next to the options tab. ???? Hmmmm........ I created a dummy screen name/account "testing123" and it is working for the dummy. All I can suggest is that your browser doesn't like the forum software. Could be something in your browser settings, I dunno. Sorry, testing what happens when you're not logged in. I believe MediumBore was not actually logged in when he posted. The forum software will allow someone who's not logged in to post a message using anything they wish for a user name. For example, see the "jwptest" message just before this one; I was not logged in and there is no real user of this forum named "jwptest". My apologies for doing that, but I don't have a phpbb of my own to muck about with and I couldn't think of any other way to be certain it worked as I thought it did. If you aren't logged in, the posting page looks like the one I attached to this message. Note, among other things, the absence of the "Upload attachment" tab at the bottom of the page. The right side of the page has been trimmed off to meet the uploaded image size restriction; it does contain the normal emoticons, etc. Thanks for that insight, jwp. Yes, I deliberately set up the forum so that non-members could post, because sometimes people have trouble logging in (they forget their password and then accuse me of banning them from the forum). So far, no spambots have taken advantage of the guest posting feature, so I don't have any issues with guest posting. However, I was not aware that guest posts would show a screen name. I assumed they would show up as "guest." I'm going to leave the forum settings the way they are and hope that MediumBore's difficulty can be resolved by logging in. By the way, phpBB is free, open source software that anyone can install on their rent-a-server (assuming the server runs compatible versions of php and MySQL) I pay $4.99 a month for my rent-a-server. Think about that next time a forum hits you up for a donation, or sells their soul to "sponsers." The downside with phpBB is that spammers have access to the source code, since it is open source, and there have been some serious spamming and hacking problems in the past. The Marlin forums were hacked pretty bad a few years back (they neglected to install security updates). However, at the moment I am happy with the current version of phpBB.